Being a police officer is a busy and stressful, they’re busy catching criminals and making sure that the surrounding community is safe and sound. This is true for most police officers around the world, especially the officers in Malaysia, who have been confronted with this bizarre looking creature that looks just like a mixture between a cat and a human! This is surely a joke, right? Nonetheless, the story about this creature went viral and everybody was quick to believe every word that they heard. Especially when the photos came out. It looks so real! According to the story, they happened to have found this creature in this southeast Asian country and so, the police there have had quite the fiasco on their hands. This strange incident involved a truly hideous and strange creature which many were unable to identify. In fact, the best way to describe it was a cross between a human and a cat. You can only imagine their complete shock at this incredible find. The face and hairline is what gives this creature a human-like quality. That’s because most cats have hair all over and yet this creatures has a distinctive face which is completely separated from its hairline. Also, the ears have a human quality as well. Overall, finding something like this would definitely make you wonder what’s going on in the world if creatures like this are walking the streets of Malaysia! 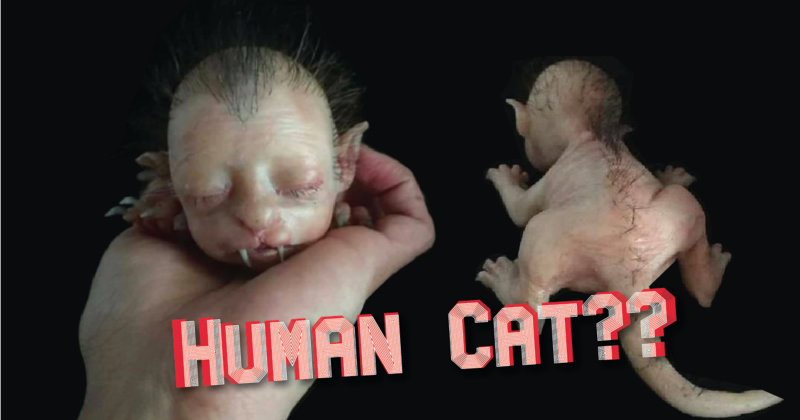 This strange creature can only be described as part human, part cat, and possibly part alien! Who wants to hold the baby? The first think that can be established is the fact that it doesn’t actually look “alive” at all which can give us some initial peace because, if it was real, then at least it’s not running around the streets. With that said, now we can decipher it’s whether it is actually real or not. The emergence of this strange creature has caused quite a bit of confusion, with many people wondering if this creature is actually a real-life animal or just another crazy work of fiction. However, if it was real, there are questions which come to mind and that is – the creatures parents? I mean, is it a strange combination of two animals, or was there actually some human DNA involved? This odd situation escalated rather quickly! In fact, the police were forced to publicly deny that this strange and terrifying creature wasn’t wandering the streets! In doing so, they put a lot of people at ease. I mean, the thought of such a thing existing is enough to make shivers run up and down your spine! There’s no creepier feeling than the thought of running into something like that. However, now we must determine the origin of it because it is something that looks absolutely real in all of the photos. Therefore, it makes you wonder who made it and how it was made. It also begs your curiosity to come up with a reason for why it looks the way that it does. The fact is, someone’s mind invented this! Now, what part of the imagination would do such a thing? To many of us, this must feel like a totally unlikely situation. However, the people of Malaysia were terrified that this creature was real because of how real it actually looked! Even so, there are plenty of level-headed people who are willing to come to the conclusion that this creature is entirely false. That is, a creation that was intended to sway people into thinking that it was real through pictures only. Admittedly, they did a good job! Therefore, it was never real even though it looks so completely real! I mean, who would come up with an idea like this? Let alone, make it in order to fool people otherwise? How were they to know that this miniature beast wasn’t some ghoulish baby troll? The government needed to be alerted! With that, came a public declaration that this was real at all but, in fact, a pretty elaborate creation. You may think this is some strange exaggeration, but people actually thought that this creature was living and breathing! The photographs of the creature in question were shared all over the internet, which forced the Malaysian police to deny it’s existence. But even with the police denying that this creature was fake, people were still skeptical over it. This spooky looking creature is almost entirely hairless, it even has a tail and four paws! When you look closely at it, you ca see that it is quite detailed and even realistic. For that reason, many people were eager to believe that it was real! Those who see these photos have every reason to think it’s real when you look at those devastating claws and pointy teeth. Honestly, it’s like nothing else I’ve ever seen! Which is one reason to why people should never jump to the conclusion that something like this is real to begin with. This creature was designed to look like a baby and to even trick you into thinking it looks adorable. In fact, it almost looks like a science fiction creature that is completely alone in this big world. I wonder what hybrid of animal this little creature is based on? Just look at how sharp those fangs are! I bet they could do some serious damage! When the photos were originally shared on the internet, someone craftily created a fake backstory for this imaginary creature. They claimed that this creature was ‘found’ at the Pahang border and was being tested on in a secret laboratory. Looking at the pictures, that’s enough to make it begin to sound like a believable story. I mean, where else would this thing be at home other than a secret lab? It’s enough to make you feel so for the poor creature. Thankfully the Datuk Rosli Abdul Rahman (a high ranking police officer) stated that the pictures were entirely fabricated and encouraged people to forget about the photos and to even stop sharing them. But unfortunately for him, the photo had already been shared thousands of times across the internet. I guess that’s just what happens when something like this goes viral, people can say it’s fake as much as they want, but there’s always more people sharing! “Checks revealed the images were downloaded from the internet before it was shared on social media, claiming that the discovery was made in Pahang. He also stressed that there were no official sightings of the hideous beast, anywhere. EVER! However, the world is not about to let this go! Even if it is a fake, it is a well done fake that both excites our imaginations and drives our curiosity as to why someone would do such a thing. Seriously, it is as mysterious as crop circles when you see the photos! It should be said that anything that can’t be readily explained will tend to taunt us with their existence and I’m sure that it has something that has stirred up quite the controversy. So, ladies and gentlemen, there is no need to panic about this nightmare creature because it never even existed! Thank goodness! 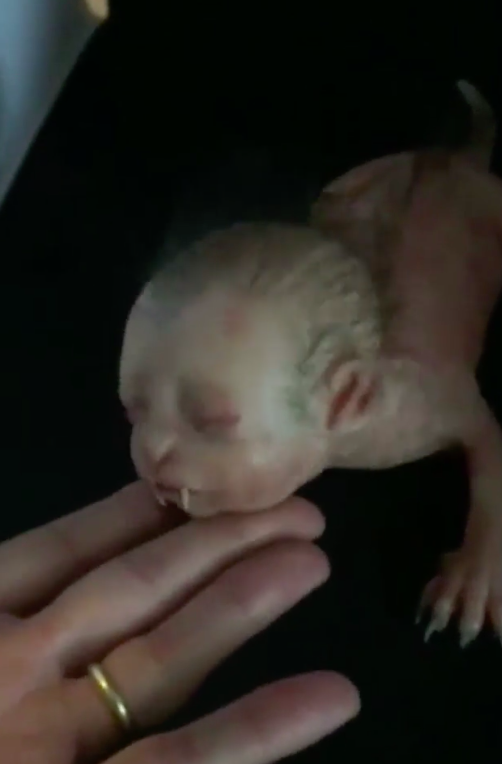 Even so, it still makes us wonder is such a creature may exist in our world but in this case, it’s just a custom made silicon baby doll apparently! And a very good one! Every time I see these pictures I marvel at how real it looks. Needless to say, we are grateful that we don’t have concern ourselves about whether this is real or not. The answer has been established that it is definitely NOT real. Honestly, it seems like you can buy just about anything online these days! Who the heck would even want to own a creepy looking half human baby, half cat baby thing? I guess it takes all sorts, and people will pay anything for Halloween decorations! There’s nothing better than getting your friends and the public all worked up about something creepy that doesn’t really exist and then making them believe that it does for a short while. Thanks to the internet, this story was perpetuated throughout the world and it really got people wondering what the heck was going on in the streets of Malaysia! Oh I see, it’s just one of those platinum silicone baby werewolf silicone things everybody is talking about. Plus it’s available from today! Perfect! 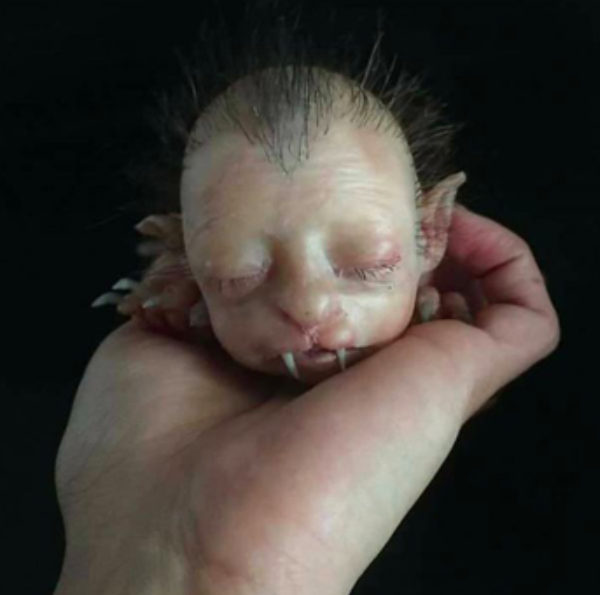 That’s right, this creature is just a doll which resembles a baby werewolf and is currently being sold on the internet. Whatever! So, pick one up for yourself and tell your friends that you captured this so-called creature in the streets of your town! Did this little werewolf baby have you fooled? Perhaps you were sceptical from the start, or maybe you think that maybe there really are all kinds of fantastical creatures out there that we don’t even know about! Well either way, feel free to let us know all about it in the COMMENTS! Don’t forget to SHAREthis strange story with your friends and family too! Thanks.